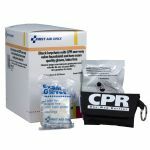 The CPR Microshield was designed to meet two critical requirements: protect the rescuer and allow the rescuer to perform proper CPR according to the established guidelines and procedures. Our patented one-way valve and single piece design assures the rescuer that our barrier will not leak and will maintain its integrity when performing CPR. To guarantee that our barrier will perform the highest quality standards, every CPR Microshield is 100% tested and 100% inspected. When called upon to give CPR, you can perform this specific procedure exactly as you learned it in your CPR class. 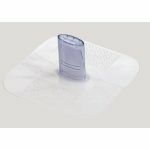 Many devices require deviation from established procedures with complicated hand seal methods instead of the established mouth to mouth seal. When it comes to protecting yourself while trying to save a life, why would anyone settle for anything less than the CPR Microshield? The CPR Microkey offers the protection of the finest barrier device available with the convenience of a key chain. An important factor in being prepared to save a life is to always have your barrier device with you. 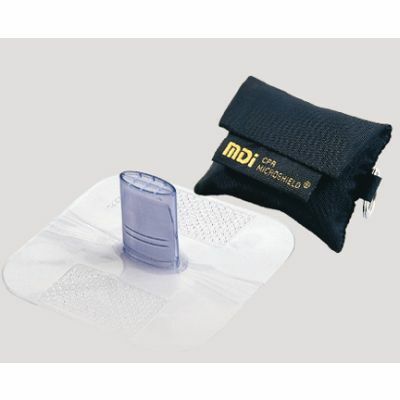 The compact pouch is made of durable nylon with a hook and loop closure.